APBF has been actively engaged, over the course of the last five years, in the consultative research and development of a relevant value generating, industry networking template and schedule, which it will roll-out across sub-Saharan Africa. 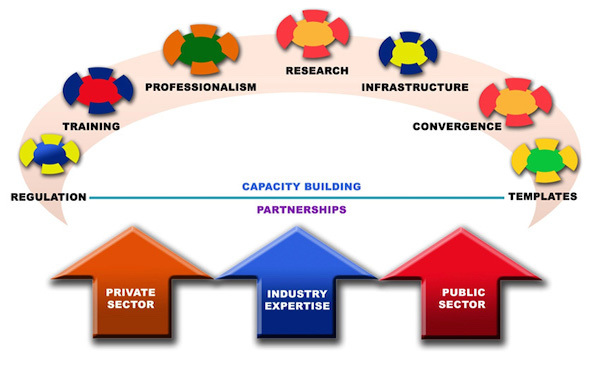 In line with the diagram above, APBF's long term goal is to design and implement turkey training programs that will enhance the output and profitability of it's membership predicated electronic media owners across sub-Saharan Africa. For that reason, APBF has created a strong skills transfer and sharing networking support system comprising established international industry professionals and commercially focused multimedia corporations. The intent is to bridge the knowledge gap between the continent's burgeoning digital media innovators and the rest of the world. The motive is to attract adequate levels of investment capital into Africa's nascent electronic media and content industries.